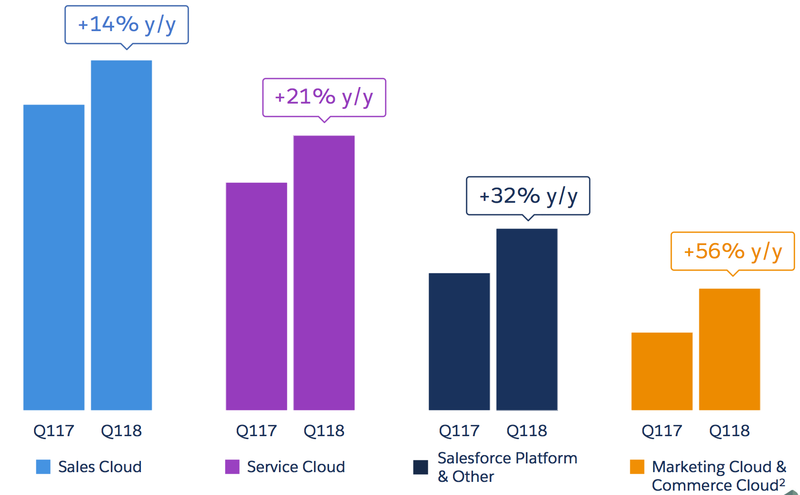 It’s clear that Salesforce has been on a phenomenal revenue growth run the last five years. And investors, seemingly pleased with the results, have rewarded the company with new share price records this month. All that begs a simple set of questions: What is driving growth at Salesforce, and can the company possibly sustain the run it has been on? The company’s quarter was a triple-beat, with Salesforce turning in more revenue, profit and projected future growth than investors anticipated. Concerning top line, Salesforce turned in $2.39 billion, above expectations of $2.35 billion. On the adjusted bottom line, Salesforce earned $0.28, above expectations of $0.26. And, the firm now expects its current fiscal 2018 to yield between $10.25 billion and $10.30 billion in revenue, between $1.28 and $1.30 in adjusted per-share profit, and $0.06 to $0.08 per share inclusive of all costs (GAAP). Q2 FY18 Guidance: Revenue is projected to be approximately $2.51 billion to $2.52 billion, an increase of 23% to 24% year-over-year. 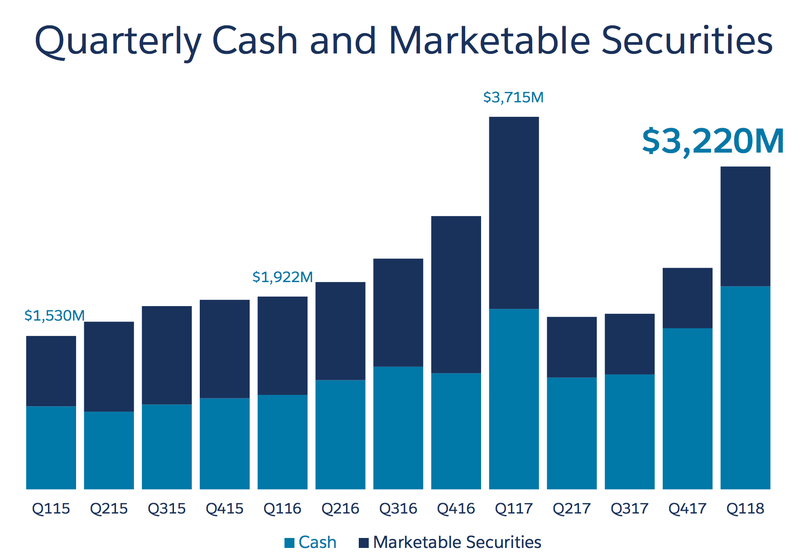 At the $2.51 billion, or $2.52 billion mark, Salesforce will cross the $10 billion revenue run rate mark. Now, not all of Salesforce revenue is purely subscription (SaaS), so we should not call its full revenue tally recurring revenue. As such, it’s too soon to say that the company’s purely annual recurring revenue (ARR) will crest the $10 billion mark in the current quarter, but the company has begun the march toward that previously stated goal. Regardless, a picture tells a clear story. From its most recent earnings deck, check the Salesforce revenue chart. At the same time, observe how close the small blue line stays to zero, what we can think of as the “break-even point”. 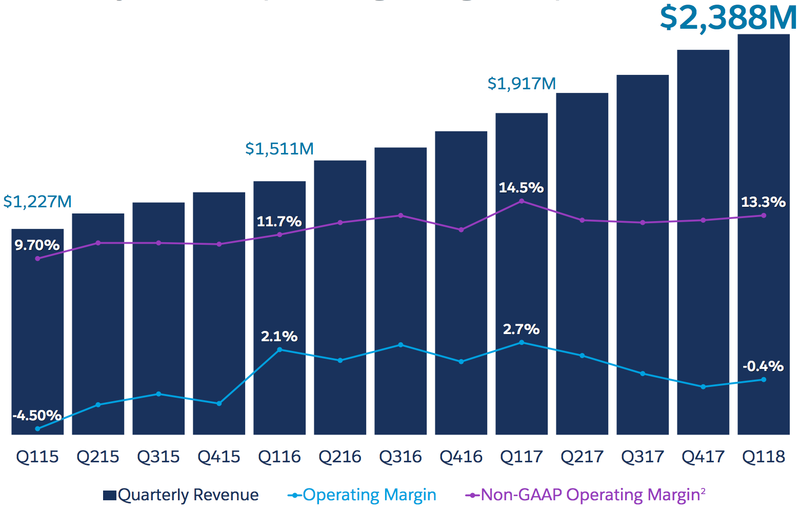 By staying close to zero, the blue line shows that with all costs taken into consideration (GAAP), Salesforce has historically not lost or made money from its operating activities. That means its day-to-day results have made it little to no money. Instead, Salesforce has reinvested into growth consistently as it has matured. Adding to the company’s guidance, it will maintain GAAP profits in its current fiscal year. As such, the company will manage to keep up its consistent growth, including its recent top line beat, while sustaining true profitability. Taken all together, it’s not hard to see why investors have had positive feelings about the company’s recent performance. Certainly one factor contributing to the growth has been Salesforce’s acquisition strategy. 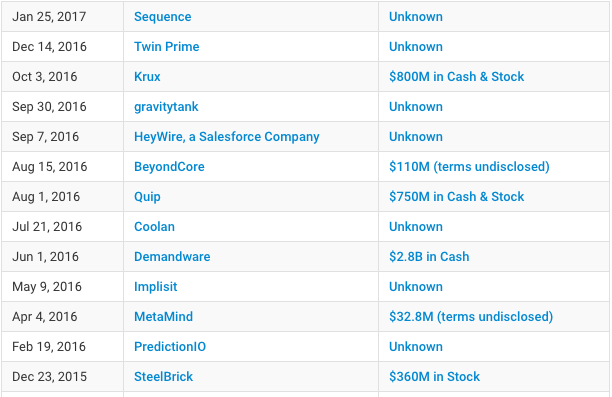 Last year, the company went on buying a spree, acquiring an astonishing 11 companies, while spending at least $5 billion, according to Crunchbase data. It has been far quieter on the acquisition front this year, grabbing just a single company so far. Those acquisitions not only bring in technology and talent, they help add markets and build revenue (at least when they choose wisely and well). The strategy appears to be working for the CRM giant as the revenue has continued its steady rise upward from around $3 billion in 2013 to close to $10 billion this fiscal year. The acquisitions, which last year included big deals like Demandware for $2.8 billion, Krux for $800 million and Quip for $750 million have brought down their cash position, but have helped fill out the product portfolio and bring in new customers and additional revenue. The company discussed the impact of these acquisitions in its earnings call: “And our portfolio has not only gotten stronger as we have continued to strategically invest in our business, but as you know, last year, we also acquired a number of amazing companies, and the integrations of these acquisitions has been very successful,” Benioff stated in the earnings call with analysts and press earlier this week. Another big contributor to the growth engine has been a willingness to invest in new tech like Internet of Things and artificial intelligence, Brent Leary, a partner at CRM Essentials, who follows the CRM industry closely told TechCrunch. Leary says the company is hitting on all cylinders and part of the reason is that they are really good at evangelizing the path for where CRM/Customer Engagement seems to be going. “They were ahead of their competition with evangelizing AI, and they always seem to steer the conversation in the industry,” Leary said. While Leary has witnessed an industry-wide shift to AI, he says the conversation really picked up after Salesforce announced the Einstein AI platform just before the massive Dreamforce customer conference last year in San Francisco. Salesforce often uses this conference as a springboard to deliver new tech to average business users, who might not have any idea how it applies to them. Leary is predicting they will build on last year’s AI announcements and introduce more conversational interfaces like Alexa from Amazon this time around. He believes it’s a logical extension of last year’s initial plunge into AI and fits with Benioff’s new-found love for all things Amazon. “It looks like CRM in general is the fastest growing category in the enterprise space. I think AI and conversational interfaces are going to drive accelerated and prolific changes to customer engagement over the next few years. And Salesforce is positioning themselves to be at the forefront of all of that,” Leary explained. If that’s correct, then this growth trajectory could continue. The company’s revenue is bucketed into four categories. There is a symmetry to their results that is worth noting while looking at the firm’s combined growth results. The trend as you might expect shows that Salesforce’s smallest revenue categories are growing the fastest. In fact, there is a reverse correlation between size of revenue category, and the pace of growth. That means that despite the CRM niche growing as quickly as Leary anticipates, the firm has other incomes that could bolster growth on their own. In short, the company is diversified more than it might appear at first glance. Still, Salesforce’s success demonstrates that its market positions are valuable. And that fact has attracted no shortage of competitors, from startups all the way up to Adobe and Microsoft, their close frenemy. Of course, not one of those firms wants to see Salesforce grow another single dollar. They might be disappointed to hear that Benioff, sensing the $10 billion run rate is within reach, has already set the next milestone at $20 billion.